We’ll be giving away $300 in cash and five free admissions to our popular work-from-home job-finding course (a $245 value). The five entries that obtain the most votes before the deadline will win cash prizes. First place will win $100. Second, third, fourth, and fifth places will each win $50. Once the voting ends and the cash winners are decided, the five free course admissions will go to the RRR “staff pick” from each of the five following categories: Best Dressed, Bossiest, Cutest, Most Exotic, and Laziest. Everyone can vote once a day, so don’t feel discouraged if you’re late to the party. However, all entries must be submitted no later than April 21, 2019 by 11:59PM EST — so don’t wait too long! We’ll announce the winners via email on May 1, 2019, and then on our blog and social media channels. 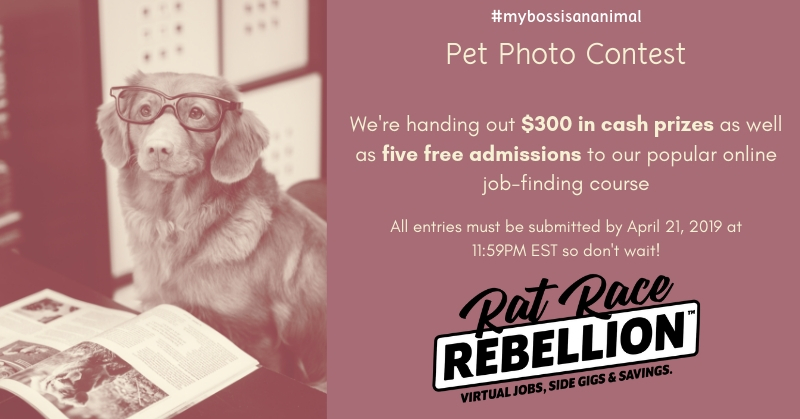 If you don’t have a pet to share for this contest, don’t worry! We’ll be launching future contests and giveaways from our Instagram account. So Follow us there and stay tuned! In the meantime, feel free to pop into the contest and cast your votes, as well as share the contest with any family and friends who might be interested.